Offering up the chance to win the the bike of your dreams built however you want from Santa Cruz Bikes seems like a no-brainer premise, but this runs a bit deeper than that. 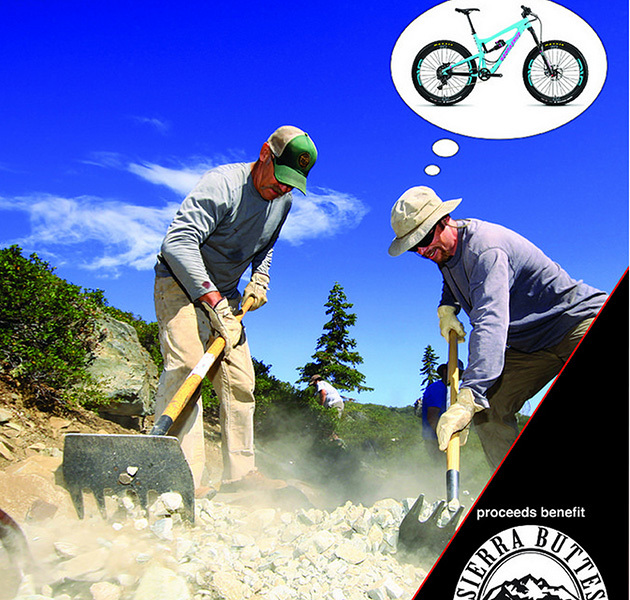 "Five Bucks A Foot” is a campaign being run by the Sierra Buttes Trail Stewardship to generate funding for, as well as interest in, their ongoing trail construction projects. Initially, the idea started when the stewardship was faced with a bleak outlook for grant funding while planning for the extension of Butcher Ranch Trail at the top of the famous Downieville Downhill. Hoping that a lucrative bike prize would get peoples’ attention, there was the small matter of needing to clarify the fundraising as something other than a raffle. So, the idea of Five Bucks A Foot was hatched. The basic cost of on the ground traibuilding in the northern Sierra Nevada averages out at about $27k per mile. Or, a little bit more than $5 a foot. Some work is easier and costs less, but when the rock splitting in the hard granite begins, it can end up costing a whole lot more, as the railroad building pioneers found out back in the late 1800s. Still, for the purposes of the Sierra Buttes Trail Stewardship and the work they are doing around Downieville and further afield toward Lake Tahoe, the phrase has become an easily visualized way of explaining just what it is they do with the funds generated. They build trail. World class, ripping singletrack. This campaign is the Stewardship's fourth, runs until May 31st, and the prize being dangled is any bike from Santa Cruz, built however the winner wants. Each five feet of trail funded represents a chance to win. There is no upper limit to how many feet an entrant can purchase, and the more trail funded, the more trail gets built. Simple as that. Heck, while you're there buying some trail, why not join the stewardship, like their Facebook page, and tell your friends? The bleak federal and state forecast that led to the creation of this method of fundraising hasn't improved, and there isn't likely to be some cash-heavy, trail building Santa Claus figure strolling over the horizon anytime soon, handing out money and pulaskis as he goes. As such, campaigns like this, and memberships, and hard working volunteers, are becoming the lifeblood for non-profits everywhere. In this case, the Sierra Buttes Trail Stewardship is committed to taking money and sweat and turning them into singletrack. To buy some trail and be entered to win the Santa Cruz bike of your dreams, go HERE.